One of the most imposing parish churches in England. 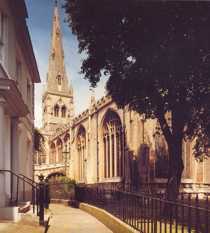 The spire, reputed to be the fifth tallest parish church spire in the country, is visible from many miles away. Of four architectural periods with the last, the fifteenth century, being of strikingly high quality. The earliest evidence is of around 1180, in its crypt; there is a thirteenth-century west tower with fourteenth-century upper parts and spire, a thirteenth-century crossing, and fourteenth-century south aisle. There are two chantry chapels dating from about 1500. The church has medieval choir stalls and important fragments of medieval stained glass.